An instrument with drums, like your keyboard, always has a beat ready to go; you don’t have to dig through a bunch of menu options or anything special to hear them. If what you get isn’t the groove you want to play, you can explore how various keyboards present their drum rhythms. Simple portable keyboards don’t always have full auto-accompaniment, but they often offer drum grooves. Casio calls them Rhythms, and Yamaha calls them Styles. Press the Style or Rhythm button. Use the + and – buttons to move up or down to the next pattern or to scroll through the available patterns one at a time. Or use the numeric keypad (if available) to directly enter the number of a specific pattern you want. On these low-end models, the pattern names may appear on the front panel. On other models, the names are displayed on the screen. When you’ve selected the desired pattern, press Start/Stop. Note that you can usually scroll or select another pattern while the drums are playing, and it will start on the next downbeat. Full accompaniment is more than you’re looking for right now. You just want to have drums playing along with your keyboard playing, so find the button that turns off the rest of the accompaniment. This button may be labeled Chords On/Off, Accompaniment On/Off, ACMP On/Off, Arranger Mode, and so on. 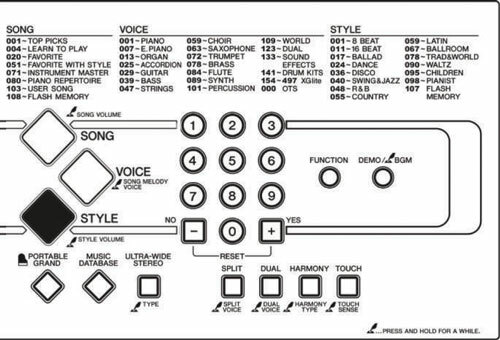 On some Roland arrangers, you need to turn off all the Backing Type elements (Style, Song, and USB) until only drums remain. With the accompaniment/chords turned off, you can freely select drum patterns without calling up a full backing band. To select a different drum pattern, press the Style or Rhythm button. You can use the + and – buttons or value dial to move up or down to the next pattern or to scroll through the list of available patterns one at a time. If available, you can use the numeric keypad to directly enter the number of a specific pattern you want. Then press Play. 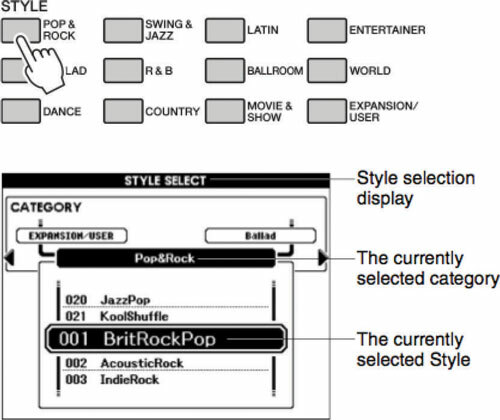 Higher-end models may present the Styles/Rhythms on multiple buttons, with each button representing a category of styles arranged by musical genre: Rock, Ballroom, Waltz, World, Jazz/Big-Band, and so on. Press the button for the category you like and select the specific drum pattern you want from the choices shown on the keyboard’s display and then press Play. Note that you can usually scroll or select another pattern when the drums are playing, and it will start on the next downbeat, or start of a measure. Synths and workstations don’t generally have full backing accompaniment but may have drum grooves set up behind their sounds. Depending on the product, the pattern is either created by a small phrase/pattern player or by an arpeggiator. Drums are usually incorporated in a multisound mode of some sort, be it a layer, a split, or a combination of both. Korg calls these Combinations, Kurzweil calls them Setups, Roland calls them Live Sets, and Yamaha calls them Performances. Some Korg models have a feature called a drum track, which is a drum groove set up behind their single sounds (called programs). They always have a dedicated front panel button for starting these drum patterns. Selecting a different drum pattern is a little more complicated in these situations than for other instruments. Go into Edit Mode for the multisound mode your product offers. Note that some products have dedicated arpeggiator edit buttons or controls available right from the front panel and you don’t need to go into Edit Mode to adjust them. Find the page for the drum pattern (phrase) player or the arpeggiator. Locate the Pattern/Arp number parameter; this number is the currently assigned drum groove for the sound. Locate and select the pattern you want to use. Use the + and – buttons, value dial, or data slider to move up or down to the next pattern or to scroll through the available patterns one at a time. Use the numeric keypad (if available) to directly enter the number of a specific drum/arp pattern you want. When you’ve selected the desired pattern press Start/Stop or Arp On/Off.